If there one thing I'm trained really well on, it's being able to operate at 110% after a night like that. The next morning, we all headed down to grab a few last minute items at Vons, then we headed for the harbor at which our chartered boat was to leave. We loaded up relatively quickly and got out on the water by 9:30a. The ride is about an hour from Oxnard, CA, across mostly smooth water. Usually there is plentiful ocean life, however we were only greeted with a California Oil Rig— amazing engineering-wise, a travesty environmentally. Arriving to the island is a bit mystical-feeling. It feels like you're arriving on something from Homer's The Oddesy. Blue water, kelp forests, tall sea cliffs, natural archways... etc. Anacapa Island is a complete cliff-surrounded island— the landing the boat dropped us off at required a lot of stair climbing to reach the trails on the top. The captain of our boat did a very precise backup maneuver to hold this boat against the landing as we and another team pulled our gear off and hauled it up the stairs to the top. Once unloaded we began carrying all of our gear the half mile or so to the campsites, making one brief, but false campsite arrival during that time. Traveling across the island, hauling lots of gear. A view of the mission-style buildings. A bit about the island; The layout of the island is actually very interesting. It sits a bit tilted on a slant and has very windy, hilly trails. In the center are a few California Mission-style buildings— one a ranger residence (which was uninhabited at our time of stay), a maintenance building, a visitor's center, and a church-like structure with a greenhouse attached. I was informed that the church-like structure was a response to 1940's & 1950's era issue where passing sailors would shoot at then-exposed open water tanks for target practice. You know what nobody has done since the building of a church-ish structure around them? Shoot at it. Genius! Now, remember how I said there was no fresh water for us? There is water in those tanks— but it's reserved for the rangers and the hydroponics at the green house for ecological repopulation, as it should be! It was quite the slog to the camp area with the 60lbs of gear or so we each had. We wasted no time, however, and we set up our site and immediate began to scout the island, taking in the views and selecting potential spots for photos later in the day when the light softens. Our first location was not too far up the hill by our site. Saturday morning sea kayaking in the Orus. All those white dots— birds. Throughout the island there were huge deposits of bird poop, seemingly everywhere. During the day, we saw very little avian life, so we were all a bit puzzled at where it was coming from. At around 5pm, we quickly learned where it all came from. Like a large cloud of contagion you would see in a sci-fi movie, huge swaths of birds came up from the sea and began to populate the island. The noise from then on and through the night was shockingly loud and every direction you looked were bird populations. It was fascinating! We moved on from there to dinner time. 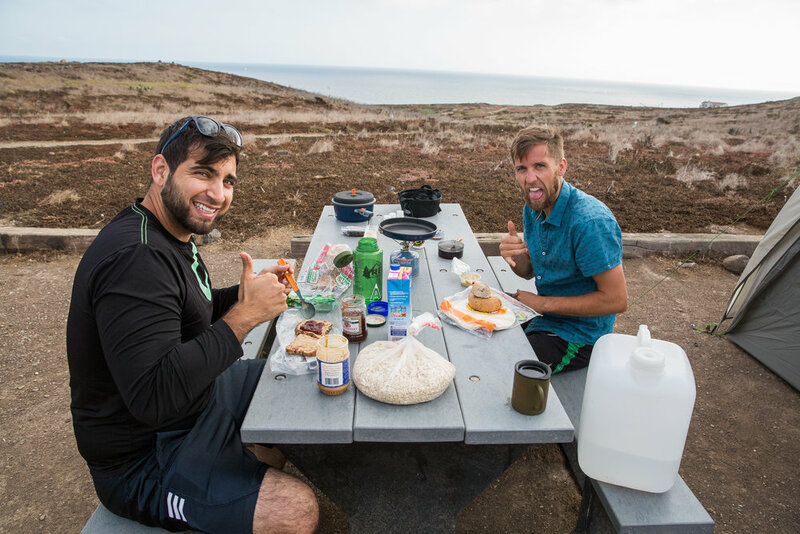 Troy and I, through many past trip experiences, have figured a perfect adventure dinner which, I'm pretty sure, is scientifically proven to be the tastiest and most nutritious post-epic-day meal: refried bean and couscous burritos with salsa/hummus/avocado. Too much good wrapped in a little blanket of flavor. Good fuel out on missions is incredibly important to stay pumped and feeling well. Sunset time was poised to be our most ambitious shoot-time, so it was a quick cleanup and rollout. Troy and I discovered an access point to scramble across the ridge line at the tip of the habitable portion of Anacapa. This was going to provide us an amazing background to create photographs with— but by far a dangerous one. The slippery, rocky scramble is over complete choss– otherwise known as the crumbliest, most unstable rock out there. We slightly amended the danger of this by running back to the boat landing and grabbing whatever spare rope we could find. Being a group of climbers, the only rope available for use made us all cringe. It was an old, crusty, thick rope that look like it came off of a boat from the medieval era. Nevertheless, we were able to create a viable anchor and human backups to raise and lower Troy. Thankfully, he is a master of these tight situations and successfully executed his mission across and back without the need of this sea rope. See images below for the results. Very worth it. Looking back along the ridge line of Anacapa. What an amazing place..
Our night only got better from there. After we popped off a few more images, the sky went dark. We made our way back to camp and played some games in the condo-tent our friend Michael brought. After a few rounds it was time to call it a night since we had an early start to the next morning. We began to be worried about Major Obvious and his crew since it was well past dark and they were not back from their island circumnavigation mission. After some deliberation about what to do, we heard their voices approaching. Phew. Off to bed everyone went. I immediately fell asleep since I had slept pretty poorly the last couple of nights. I am told that the others had quite the time getting there due to the sheer noise on the birds and the noise of our sea kayaker friends burning the midnight oil in the form of whiskey. 6:00am comes around and all but two get up to watch and photograph sunrise. Everything about this place was beautiful, but especially the sunset and the sunrise. They never get old. TK wear Ryker frames in White. TK wears Huddie frames in Navy/Yellow. My favorite frames. If you have read until this point, thank you! I will include a rally of snapshots below that I couldn't include above. Also, a huge thank you to everyone on the team, you all are amazing! Thanks also to Island Packers, Lens Rentals, the NPS, Major Obvious and crew, Alex & Brian for the Oru's, and last but definitely not least Revo Sunglasses.